For many of us, the bathroom is the room that gets neglected the most. But why? Most of our house guests use it, we use it, shouldn’t it make you just as happy as the rest of your home? Here are some of our favorite bathroom transformations ranging from a full remodel to some simple tips on revamping the space you already have. Enjoy! Tara of Lehman Lane transformed this worn out bathroom into a bright and clean looking space for her boys! She did a great job displaying how farmhouse style doesn’t have to be overly feminine. We love how she maximized the space in this room to make it a very functional room. There’s nothing quite like a good before and after. It’s always amazing to see how a few simple design choices can completely transform a room. Head over to Lovely etc. to see the rest of the photos of this bathroom. If you can believe it, the “before” photo above isn’t even what it looked like originally (hint: wallpaper was involved)! I love this transformation because it shows what can be done on a budget. This makeover only cost $100! Lemons, Lavender, and Laundry did a great job reusing this builder-grade vanity and giving us hope for the boring features of our homes that just have to stay. Sometimes, working with what you already have yields great results! If you think your bathroom is bad, you need to check out the “before” photos of this one over on Designers Sweet Spot. I didn’t have much of a budget to spend on this project, but this is probably one of my greatest transformations yet! Let’s be honest, anything would’ve been an improvement over what we had going on in there before. Remodels like this one always astonish me. At first look, you’d guess that the bathroom was built like this. Love Create Celebrate didn’t leave anything out in this transformation, it’s beautiful! Average Inspired did a great job demonstrating how sometimes all you need is a bit of paint and some new accessories to transform you bathroom! Now that’s something anyone can accomplish. This is one of my favorite transformations. I always like the idea of bold colors, but especially in a small room, white is usually the best choice. Little House of Four chose to replace the bright red wall with white to open the space up, but use the floor tiles as the focal point. This is a bathroom you’d want to show off to your guests. Art is Beauty has lived in her home for over 20 years, and decided it was finally time to give the bathroom a face lift. She kept all the fixtures, but used paint and even a bit of wall paper to add a different feel to the space. Yet another example of why paint is the most important tool in a transformation. Natalie from A Turtles Life for Me added a lot of character to her kid’s bathroom for just $100. I’m sure many of you have bathrooms in your home that look almost identical to what this one looked like before its transformation. Something about this bathroom reminds me of a 5-star hotel, it must be all the marble! Who wouldn’t want to feel that level of luxury while getting ready each morning? Head over to Tidbits to see the full transformation. 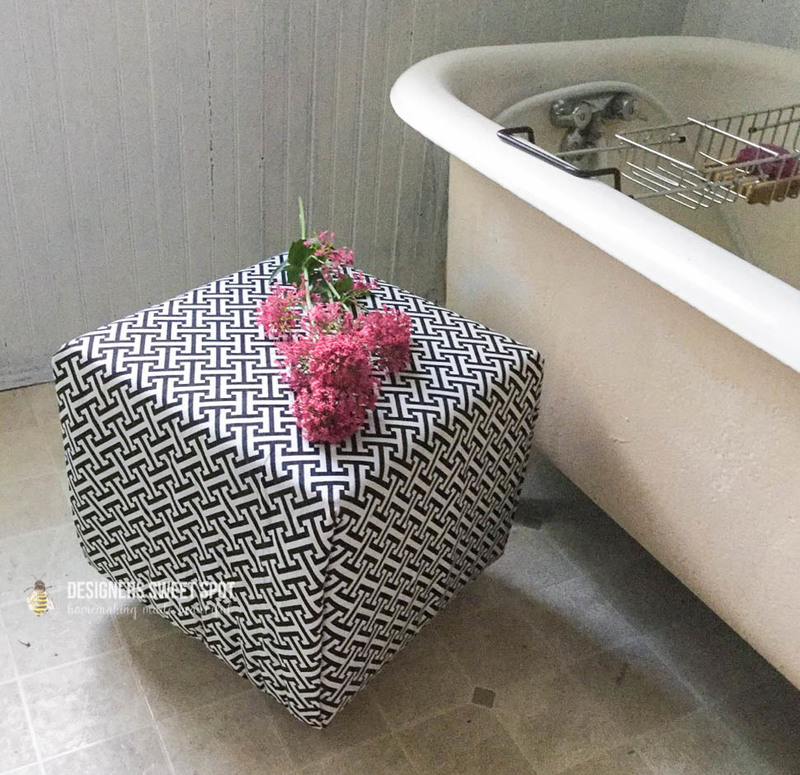 My Fabuless Life brought this bathroom back to life using items found at yard sales and the Target clearance isle! They also retiled their floor which made a big difference for this small room. Wallpaper is becoming more and more popular, but it’s so expensive! Paper Daisy Design shares a genius way to make one roll of wallpaper cover your entire bathroom, plus save time & money. Why haven’t I thought of this before?! This bathroom definitely wasn’t a budget project, but WOW! What a transformation. You don’t want to miss the before photos on Run to Radiance , I’m impressed. In My Own Style shares some of the great DIY projects she used for this bathroom makeover, including how to create crown molding and your own valances. If a bathroom remodel is in your future, you’re going to want to check this one out. What do you do if you really can’t stand your space, but there’s no money in the budget? Re-Fabbed simply added some colorful decor to spice up this room. You may even have some decorations around your home that you could repurpose for the bathroom! This transformation was based off a photo that Lost and Found Decor had seen. However, she knew she didn’t have the budget or time to pull the original off – I know the feeling. She admits that this remodel took some time, but it was so worth it! This is definition of a Pinterest bathroom. Wow! Twelve on Main and her husband did an incredible job with this transformation. I wish I could hire them to come to my home! Small bathrooms are the most fun to work with sometimes. Choosing the right colors and storage options can completely transform a space. The before of this bathroom is pretty scary, but that just makes the after that much more incredible! Head over to Addicted 2 Decorating if you want a greater appreciation for this room. One of the reasons I had to include this transformation is because it’s just so different than most you see. The Heather Nest created such a fun bathroom for her children, while still making it easy to change out the decor for a new feel once her kids are a bit older. This bathroom truly screams farmhouse! I wish I could include more photos from this transformation because it’s beautiful. You’re going to want to head over to Christinas Adventures to see the rest of the room. The colors and textures she chose are perfect. There you have it! Some of our favorite bathroom transformations!